I don't care where you live, but we grill all year round with the occasional bag in the oven, which is delicious too. If you still want to get that grilled flavor, place your ribs on a preheated hot grill and char (this only takes seconds), put in the bag and oven roast according to the directions. Otherwise, lets get grillin'. Preheat a gas grill for high heat, or arrange charcoal briquettes on one side of the BBQ. Lightly oil the grate. In a small jar, combine salt, sugar and brown sugar. Close the lid, and shake to mix. Sprinkle as much of the rub onto both sides of the ribs as desired. Store the unused portion of the spice mix for future use. Place aluminum foil on lower rack to capture drippings and prevent flare-ups. Lay the ribs on the top rack of the grill (away from the coals, if you're using briquettes). Reduce gas heat to low, close lid, and leave undisturbed for 1 hour. Do not lift the lid at all. Brush ribs with your favorite barbecue sauce if desired (we usually just stick with the rub), and grill an additional 5 minutes. 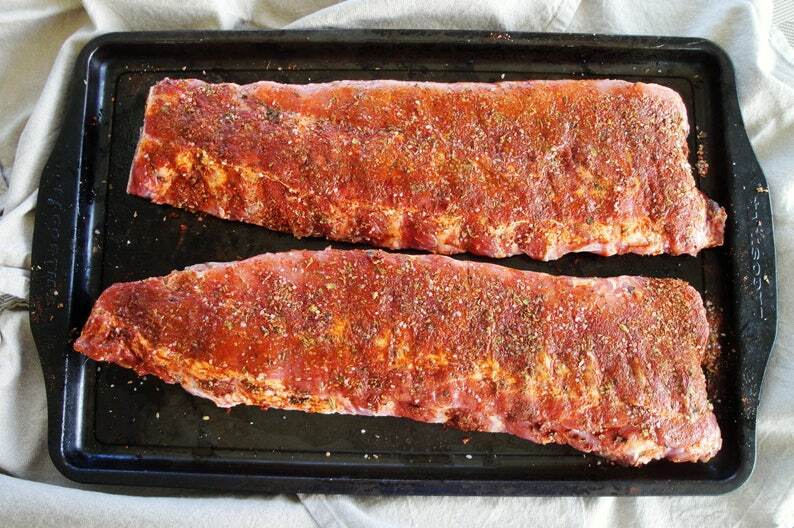 Serve ribs as whole, half or quarter rack. Please read the fine print. I misunderstood that the spices were completely done with no adding extra ingredients. I ordered two different kinds have only used 1 so far. But over all it was good on the baby back ribs!